The Indala 125 kHz Mid-Range Reader product line is HID's latest offering of highly-secure proximity readers. The HID Indala Mid-Range reader, with FlexSecur® technology, is designed for applications requiring a longer read range of up to 12 inches. These high-quality Indala Proximity Readers deliver outstanding and consistent performance with intelligent programming technology, a uniform core module, and a range of stylish bezel designs including Arch and Wave in a variety of colors. All HID Indala 125 kHz Proximity Readers feature FlexSecur technology, which provides an added level of access system security through a verification process at the reader. A unique HID Indala product feature, FlexSecur screens out unauthorized cards prior to sending access control data to the host system. The entire card data field is encrypted prior to programming the card. Therefore, the data on the card cannot be decoded to determine the actual information on the card. Only the reader is able to decrypt the data and transmit it to the access control system. Cards and readers can be programmed uniquely for each site, protecting the end user against unauthorized entry attempts by using cards from another facility. Again, a feature unique to the HID Indala product line. **Note: Dependent upon installation conditions. 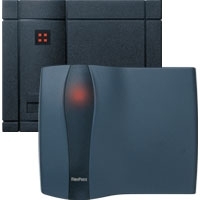 Exclusive Indala FlexSecur Password-Protected Security between card and reader screens out unauthorized cards prior to sending access control data to the host system. Indala products offer card formats of up to 172 bits, and readers configurable for Wiegand, Magstripe, and Serial output formats. The HID Indala Proximity portfolio includes classic, mullion/slim, wallswitch, mid-range, long-range, and heavy-duty keypad readers for every application.